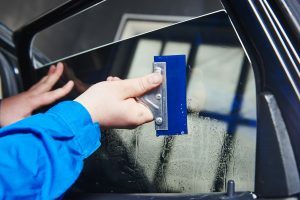 Q: Why should I get a tinting service? We’re happy to answer this one! Tinting is one of those rare commodities that offers both aesthetically-based and practical benefits. Our films will make your windows look sharp, and they reduce energy costs, glare, and temperature. It’s an investment that pays back tenfold. Q: Is tinting film good for the environment? As you may have guessed from our name, we are committed to making the world a better place and maintaining the environment. Our films are made from eco-friendly materials and can be disposed safely, so you can have peace of mind when you buy from us. Q: Where in my home can you install film? If there is a glass surface, we can place a film on it. Embrace our innovative technology and keep temperatures lower with our films. Whether you need a bedroom window tinted or want to have the whole house tinted, we’re up to the task! Q: So, you do car and home tinting. Do you offer services for anything else? In fact, we do! We also work on marine vehicles and will install film on boat windows. Since a fishing trip is primarily outdoors and excessive sunshine can do a number on your boat, tinting is a wise investment. Q: Sounds great. How do I get an appointment? Contact us through our Contact page, and we will collaborate with you to make the rest happen! We offer free quotes for our services as well, so you won’t be caught off guard and you will be able to afford the service(s) you need.